11XLP12-3S-H2 Extreme Low Power Laser Detector best suitable for low power im both the µW and mW regimes with very low thermal drift. 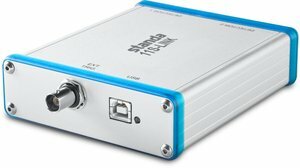 Featuring broadband flat spectral response, minimal thermal drift and a noise equivalent power as low as 0.5 µW the 11XLP12 is ideally suited for measuring any pulsed or CW low power laser. Pulsed Laser Damage Thresholds Max Energy Dens. Peak Power Dens. Max Energy Dens. Peak Power Dens. Max Energy Dens. Peak Power Dens. b. Nominal value, actual value depends on electrical noise in the measurement system. d. With STANDA 11MAESTRO, 11UNO, 11P-LINK, 11TUNER and 11S-LINK monitors. e. Maximum output voltage = sensitivity x maximum power. f. Including linearity with power. g. For 360 µs pulses. Higher pulse energy possible when customized for long pulses (ms), less for short pulses (ns). h. At 1064 nm, 1 W CW.